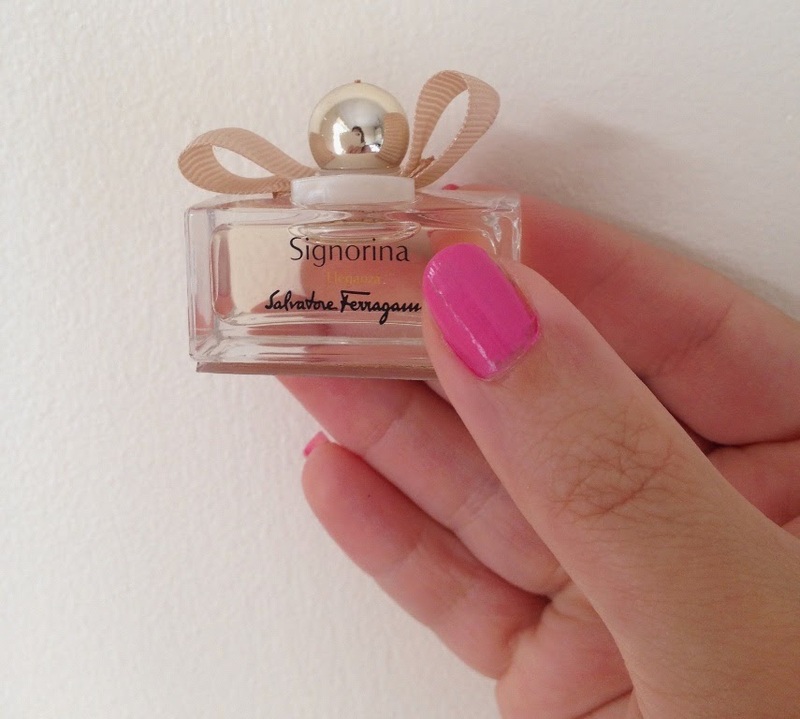 I was recently sent the cutest mini sample of the newest perfume from designer Salvatore Ferragamo. A mini version (5ml) of the bottle design, it is very similar to the actual bottle except that there are a few more bows on the lid. Utterly charming and sweet. Salvatore Ferragamo Signorina Eleganza is a luxurious fragrance that celebrates feminine and grace seduction with the fresh head notes of grapefruit and pear for a stimulating introduction, almond powder and golden osmanthus petals for a touch of indulgent luxury with base notes of patchouli and white leather, leaving a lingering scent on the skin. Signorina Eleganza is a fruity floral. It bursts onto the scene with the sparkling fresh fruit on initial spray but this soon calms to an intense and yet delicately, sweet and almost powdery heart with the almond and osmanthus petals. The cool earthiness of patchouli isn't so evident to me, the white leather blends to leave a pleasant musk dry down. It is light and yet enduring, perfect for day. This perfume is timeless, elegant and refined. A modern, luxurious scent that is here to stay. Sounds like a lovely day time fragrance. Will check it sometime.